Level 7 access granted! 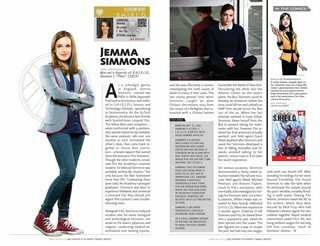 The MCU Guidebooks reach a new milestone as Marvel’s Agents of S.H.I.E.L.D., the first Cinematic Universe TV series, takes center stage! Our comprehensive coverage of the fan-favorite Marvel Studios films and Marvel Television shows continues as we reveal everything you need to know about the worldwide peacekeeping organization and Agent Coulson’s elite team!! 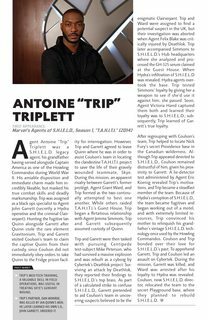 Featuring fact sheets, movie-to-comic comparisons, behind-the-scenes artwork and production stills, this issue is packed with profiles and updates on agents including Phil Coulson, Skye, Melinda May, Leo Fitz, Jemma Simmons, Antoine Triplett and the Koenigs; and foes including Grant Ward, John Garrett, Raina and Ian Quinn! Plus: Deathlok! Sif! Victoria Hand! And Hydra! Relive the thrills of 2013-2014’s Marvel’s Agents of S.H.I.E.L.D. Season One right here, and continue building your indispensable library of Cinematic Universe reference books!